Snakes make up an important part of the biodiversity in our natural landscapes and are both loved and feared by residents of the rural area. 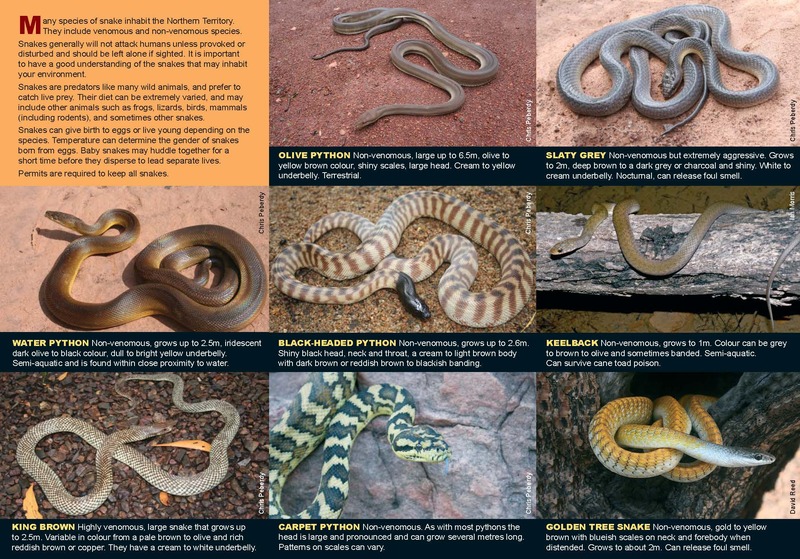 The Top End has over 40 species of native snake species- which is a wonderful diversity and one of our most common reptiles. Some residents are worried that snakes will be poisonous or attack humans (especially small children). As a whole snakes which are venomous will only bite if provoked or accidentally disturbed. Constrictors will choose easier prey. If you are unsure of a snake species do not approach them and enjoy them from a distance. The best thing people can do to build their awareness and relationship with snakes is to have more awareness of the different species and their behaviour. This starts with being able to identify them. A whole list of snake fact sheets can be found on the Department of Land Resource Management website snake link.